Setting: Matthew was a Jewish tax collector who become one of Jesus disciples. This Gospel forms the connecting link between the Old and New Testaments because of its emphasis on the fulfillment of prophecy. Key verse: "Don't misunderstand why I have come. I did not come to abolish the law of Moses or the writings of the prophets. No, I came to accomplish their purpose" (5:17). Key people: Jesus, Mary, Joseph, John the Baptist, the disciples, the religious leaders, Caiaphas, Pilate, Mary Magdalene. Special features: Matthew is filed with messianic language ("Son of David" is used throughout) and Old Testament references (53 quotes and 76 other references). This Gospel was not written as a chronological account; its purpose was to present the clear evidence that Jesus is the Messiah, the Savior. Word in life study Bible . Nashville: Thomas Nelson. Word in life study Bible .. Nashville: Thomas Nelson. The first Adam brought death through sin; Jesus, “the last Adam, ” brought life through His righteousness. Jesus is eternal, “The Beginning and the End. ” Alpha is the first letter in the Greek alphabet, omega is the last. “Messenger. ” Jesus came to bring the good news of salvation to humanity. Jesus is the heavenly manna, the spiritual food, given by the Father to those who ask for it. Jesus is the foundation of the church. The title that Peter called Jesus, indicating His oversight of His “flock, ” the church. From the Greek word Christos, “Messiah” or “Anointed One. ” Jesus fulfills the Old Testament promise of a Messiah. Jesus came to bring comfort to the nation (Is. 40:1–2). Jesus overcame death in order to give life to believers. As God’s Son, Jesus rules over everything that exists. An image that Jesus used to describe His relationship to His people. Jesus is the leader of His people and the source of their life. Like the Old Testament high priest, Jesus stands between God and people to offer an acceptable sacrifice for sin. Jesus is the sinless Messiah promised by God. Jesus expresses God in bodily form. “God with us” (Is. 7:14). The name that God instructed Joseph and Mary to call their Son. The formal title that Jesus has received, indicating His supremacy as the one to whom “every knee should bow” (Phil. 2:9–11). As Messiah, Jesus is Israel’s king, fulfilling God’s promises to David (2 Sam. 7:12–16). Jesus became the atoning sacrifice for sin. Jesus brings truth and hope to light in the midst of spiritual darkness. A title indicating ultimate sovereignty. Jesus reestablishes the relationship between God and people. Jesus is God’s only Son. Friends and enemies alike recognized Jesus as Teacher. God made promises to Abraham and his “Seed, ” whom Paul identified as Christ (Gen. 13:15; 17:8). Jesus descended from Abraham and fulfills the promises of God to Abraham (Gen. 22:18). Jesus descended from David and fulfills the promises of God to David (2 Sam. 7:12–16). Jesus is one of three Persons of the Trinity (Father, Son, and Holy Spirit). Though fully God, Jesus took on a human body (compare Phil. 2:5–8). Jesus is fully God and therefore is the full expression of God. Word in life study Bible . 1997, c1996 (electronic ed.) (Mt 17.5). Nashville: Thomas Nelson. Hosted Jesus as his houseguest (Matt. 26:6). Used expensive ointment to anoint Jesus’ head (26:7). Opened his home to Jesus and the Twelve for their last meal together (26:18). Overstated their faith (26:35); joined Jesus in a garden during the final hours before His arrest (26:40, 43, 56). Asked Peter about his association with Jesus (26:69). Also asked Peter about his association with Jesus (26:71). Also enquired about Peter’s association with Jesus (26:71). Betrayed Christ; later broke down with guilt and committed suicide (27:3–5). Was freed instead of Jesus due to a mob’s demands (27:16, 26). Was conscripted to carry Jesus’ cross (27:32). Were executed with Jesus (27:38, 44). Offered Jesus a drink as He was in His death throes (27:48). Observed that Jesus must be the Son of God (27:54). Looked on from afar (27:55–56). Word in life study Bible , Nashville: Thomas Nelson. New Geneva study Bible. Nashville: Thomas Nelson. Matthew records nine special events that are not mentioned in any of the other Gospels. 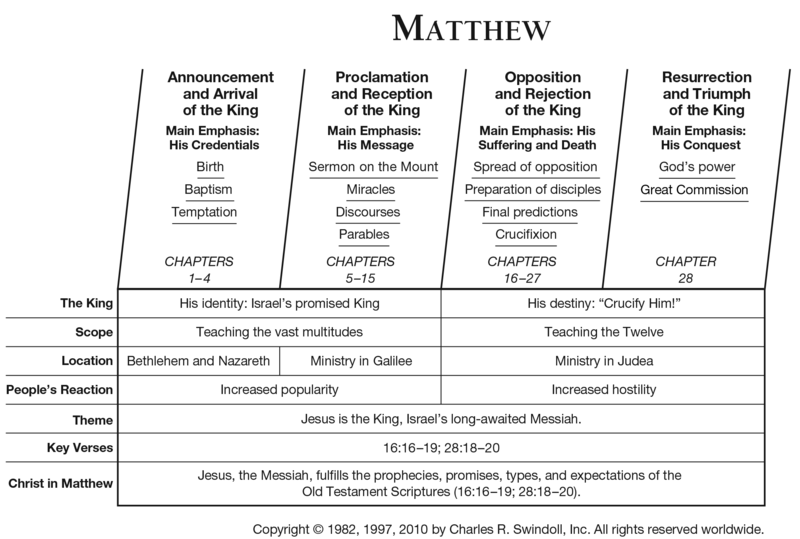 In each case, the most apparent reason for Matthew's choice has to do with purpose in communicating the gospel to Jewish people. Five cases are fulfillments Old Testament prophecies (marked with asterisks). The other four would have been of particular interest to the Jews of Matthew's day. The people of Israel were waiting for the Messiah, their king. Matthew begins his book by showing how Jesús Christ was a descendant of David. But Matthew goes on to show that God did not send Jesus to be an earthly king but a heavenly King. His Kingdom would be much greater than David’s because it would never end. Event at Jesus’ birth, many recognized him as a King. Herod,the ruler, as well as Satan, was afraid of Jesus’ kingship and tried to stop him, but others worshiped him and brought royal gifts. We must be willing to recognize Jesus for who he really is and worship him as King of our life. Jesús gave the Sermon on the Mount, directions for living in his Kingdom. He also told many parables about the difference between his Kingdom and the kingdoms of earth. Forgiveness, peace, and putting others first are some of the characteristics that make one great in the Kingdom of God. And to be great in God’s Kingdom, we must live by God’s standards right now. Jesus came to show us how to lives as faithful subjects in his Kingdom. Jesús was formally presented to the nation of Israel but was rejected. How strange for the King to be accused, arrested, and crucified. But Jesus demonstrated his power, even over death, through his resurrection and gained access for us into his Kingdom. With all his evidence that Jesús is God’s Son, we, too, should accept him as our Lord.